Randolph Central School Corporation is grateful for the addition of two production level CNC machines, a lathe and a mill. The machines were funded entirely by a donation from Larry E. Fast. Mr. Fast has also come to work directly with our students and staff in creating the Larry E. Fast Advanced Manufacturing Center. With his assistance students created the layout for the new manufacturing center which has allowed for efficient use of the space and helped to create room for future expansion. Mr. Fast also brings a wealth of experience from the manufacturing world and has instructed our students in the 5S process, (Sort, Set in Order, Shine, Standard Work, Sustain) which is a staple of how modern manufacturing functions. His book, The 12 Principles of Manufacturing Excellence: A Lean Leader's Guide to Achieving and Sustaining Excellence, is an excellent resource for our students as well and will be integrated into our Advanced Manufacturing and Precision Machining curriculum. 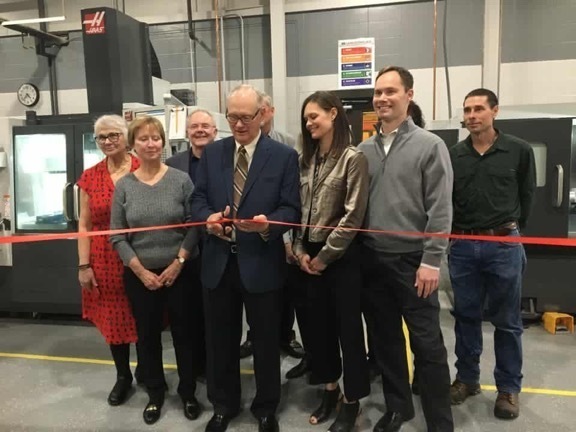 The image above is Mr. Fast cutting the ribbon at the dedication of the Larry E. Fast Advanced Manufacturing Center with his family gathered in behind him. You can see the two CNC machines directly behind them. The Haas mill is on the left side of the image and the Haas lathe is on the right.